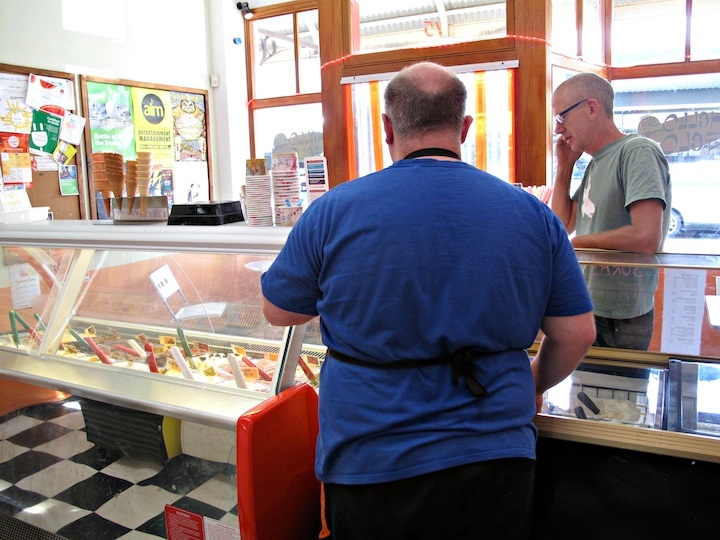 It would be glib and inaccurate to proclaim, for the purposes of this story, “summer’s here and so is ice-cream season”. 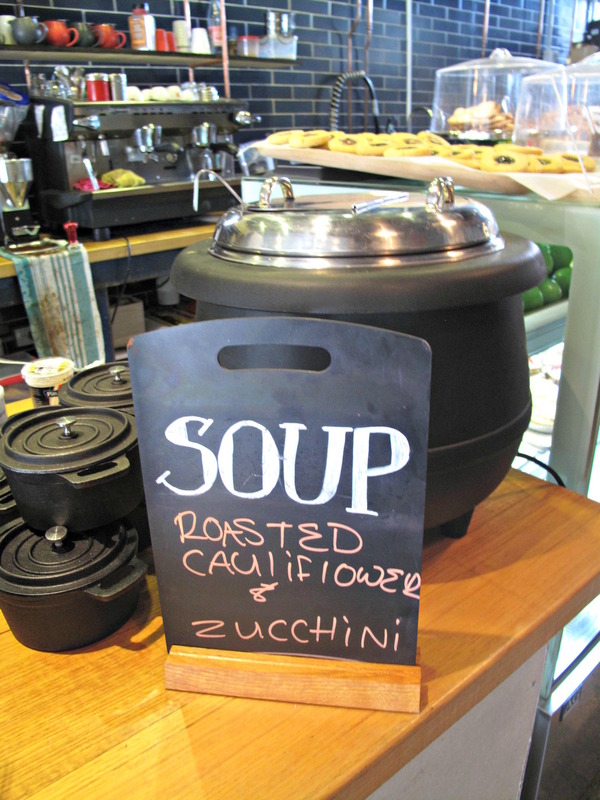 Truth is, we eat the stuff all year round and even when the weather is at its most dismal. But there’s two new kids on the block in the west and we really feel obliged – haha, our sort of obligation! – to give them a spin. See here for a handy explanation of the difference. 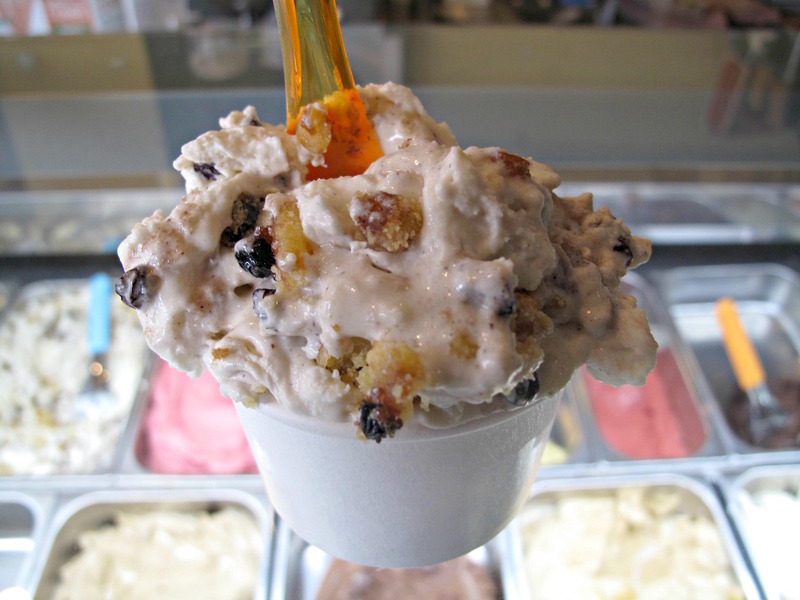 If anything, we prefer gelati, if only because it’s more likely in our world to mean in-house production by people we dig at places we love – see here, here and here. 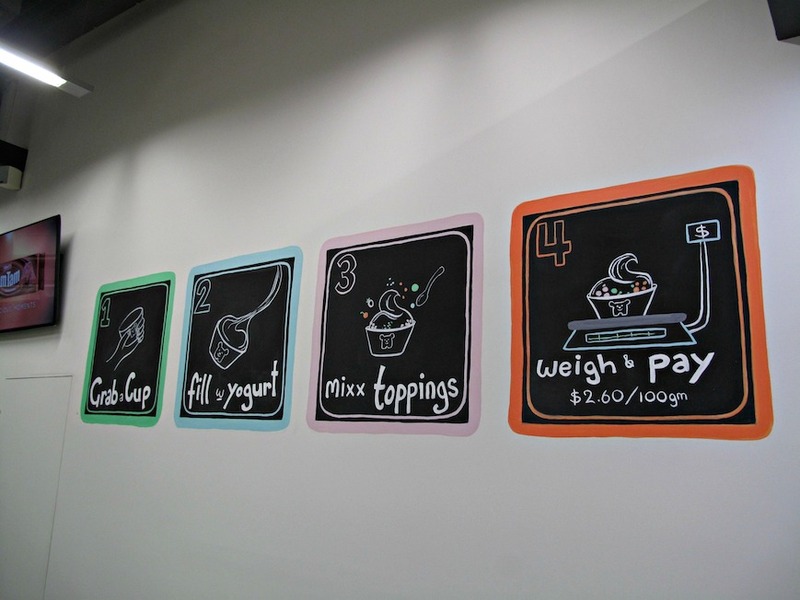 Sourdough Kitchen – long-running and beloved community fixture, source of regular work commute coffees as well as the occasional sandwich and more – and now doing their very own gelati line-up. Bennie is well pleased with his single scoop cone of chocolate gelati ($4). It’s soft in the gelati way, with much of it oozing down the cone – so I have no way of gauging value for money in terms of serving size. There’s no such problems with my cup scoop of Christmas mince pie (top photograph). This is sensational – a bit like rum-and-raisin or cassata, with plenty of fruit and texture. Friend 1 has spoken highly of the Icebear frozen yogurt. Friend 2 demures, she being something of a sweet treats maven. So we check it out for ourselves. Bennie, it has to be said, is a lot keener about this than I. 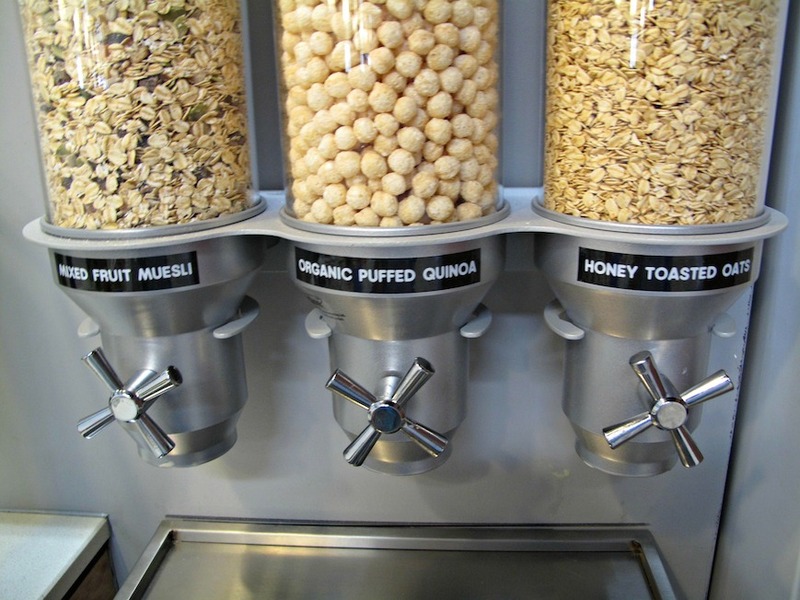 Him being attracted by the dazzle, the self-serve dispensering and the array of toppings. 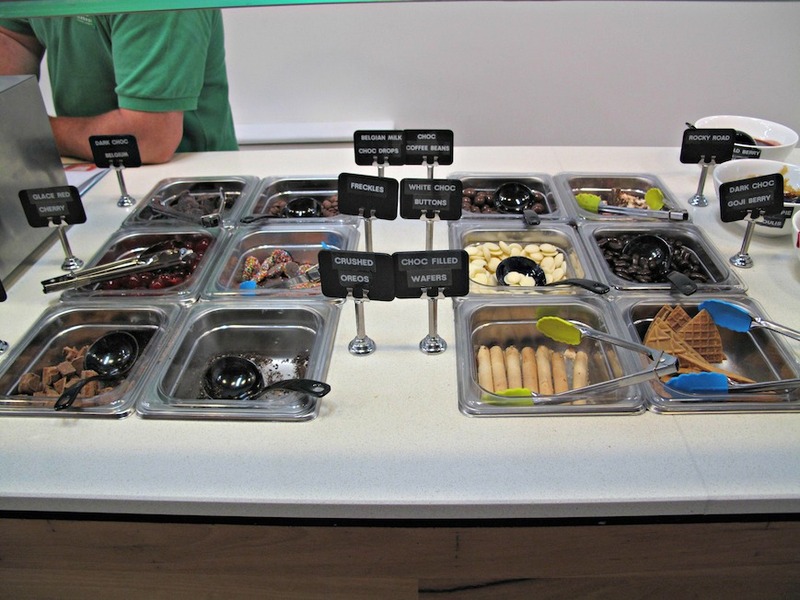 For old-school gelati guy me, some of the toppings – the chocolate bits and the nutty pieces – make sense. But sour cola bottles and the like? 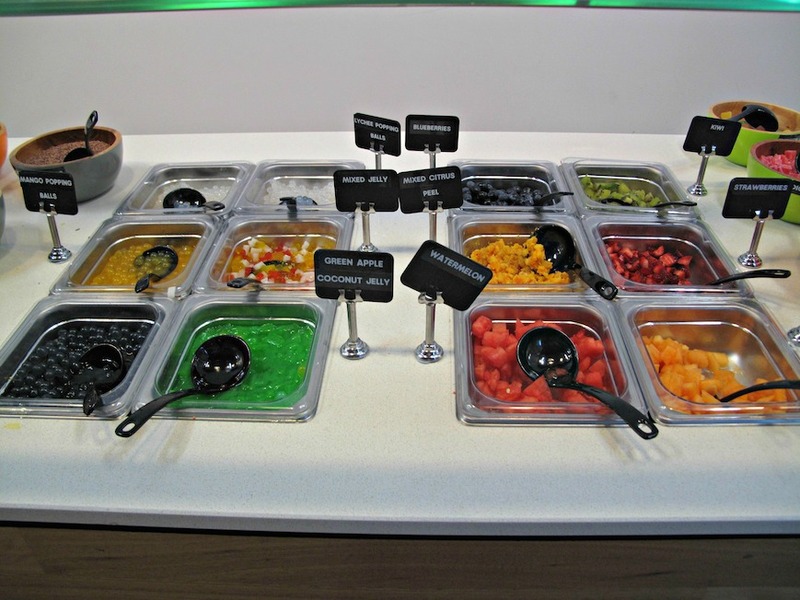 Choose your poison from the available flavours, fill a cone or cup as you see fit, top with toppings – also as you see fit. 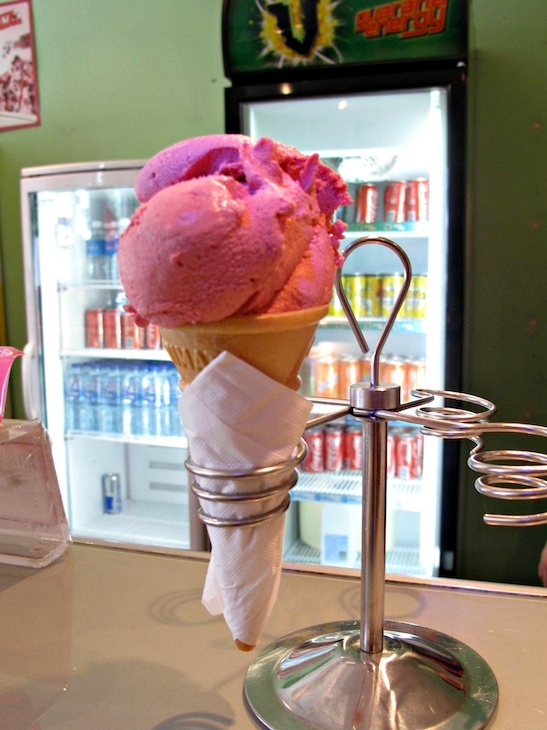 The cones are big, and even the smallest cup would seem to be an invitation to over-indulgence. I warn Bennie to try to keep it simple and not end up with an expensive mish-mash. He ignores me, though not as spectacularly as he could. 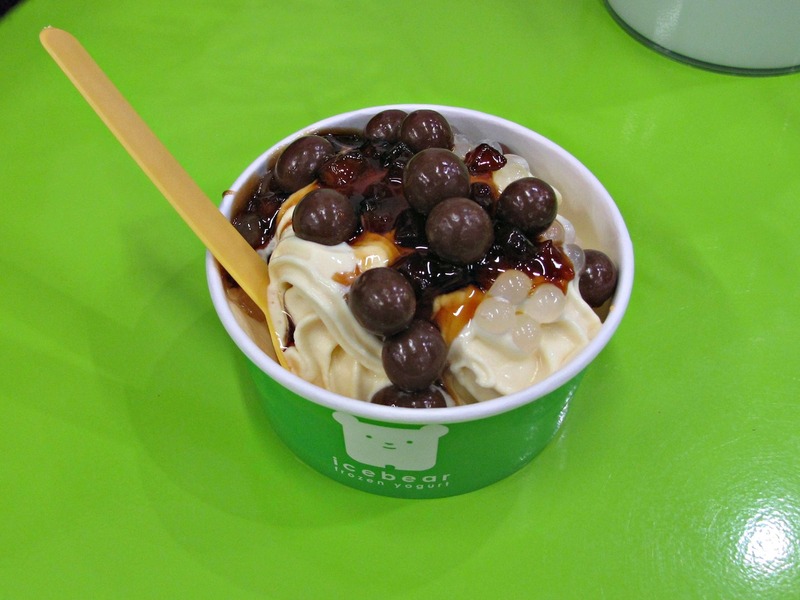 He gets apple pie and salted caramel, topped with choc coffee beans, apple pie coulis and lychee popping balls. 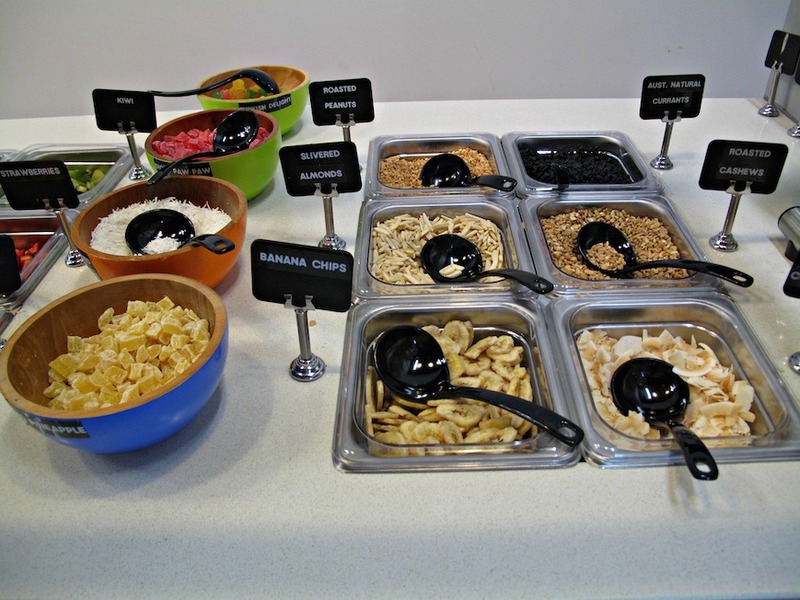 I like the yogurty tang of the main ingredients, but also find them way too sweet. Two of the flavours are labelled “soft gelato”, so that’s how I roll to the tune of $5.40. 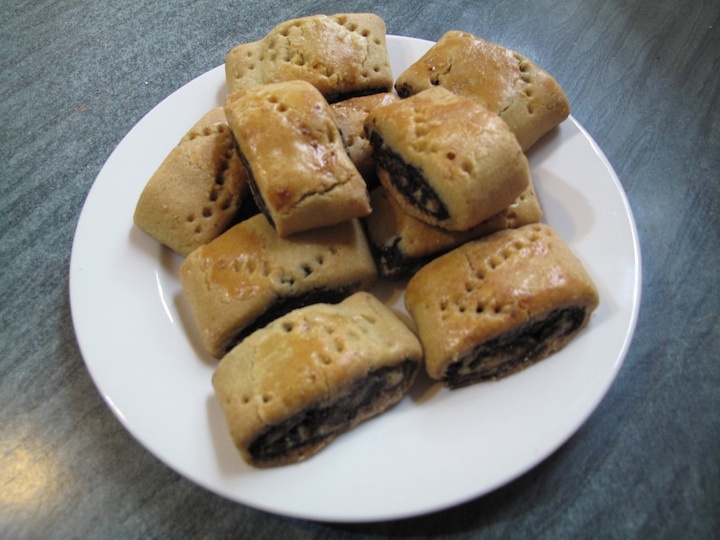 A modest excretion each of chocolate and hazelnut, topped with just a sprinkle of choc sprinkles and a couple of wafers. My dessert is enjoyable, but novelty value aside will never reside in my heart in the same way our beloved neighbourhood gelati joint does. In the end, Bennie agrees. 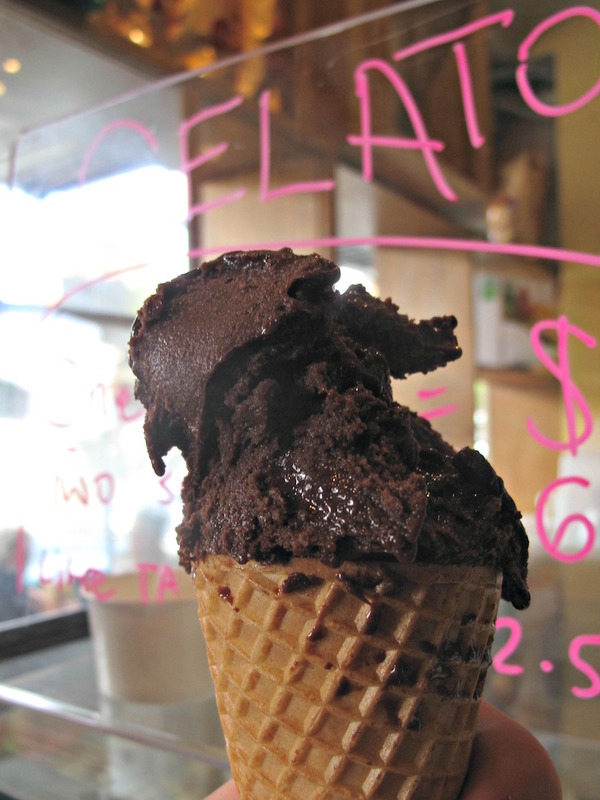 As previously and recently noted, Hello Gelo in Yarraville is very much our go-to place for gelati. Indeed, we love Scott and what he does, dig checking out his new flavours and can barely imagine life without our several-times-a-week visits to his Anderson Street emporium. 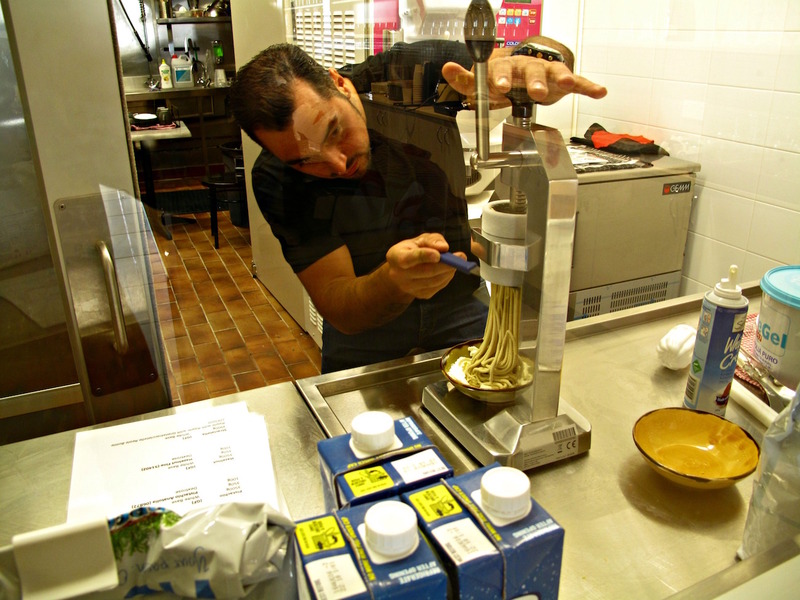 So we are excited to invited to witness him whipping up some of his gelati magic. 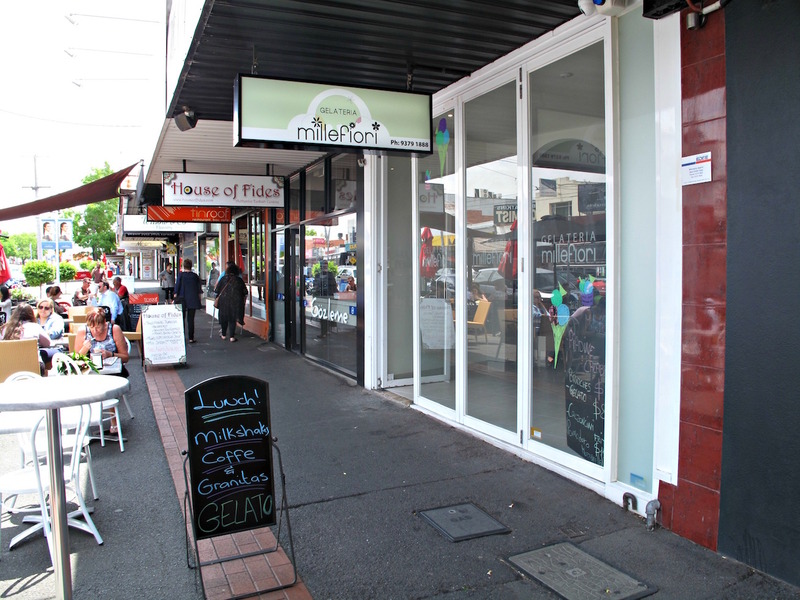 Scott has been running Hello Gelo here for about 4 1/2 years, having sold his Carlton cafe about three years ago. 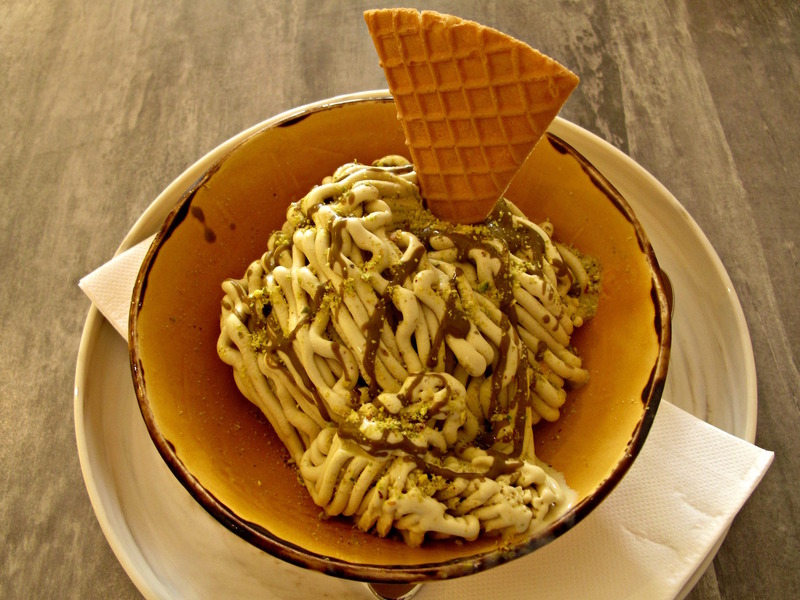 Is there a difference between gelati and ice cream? The answer appears to be “no” but also a significant “yes”. As I understand it, ice cream is higher in fat but has more air, while gelati is lower in fat but is a much denser product. Fat-wise, this would seem to balance out. 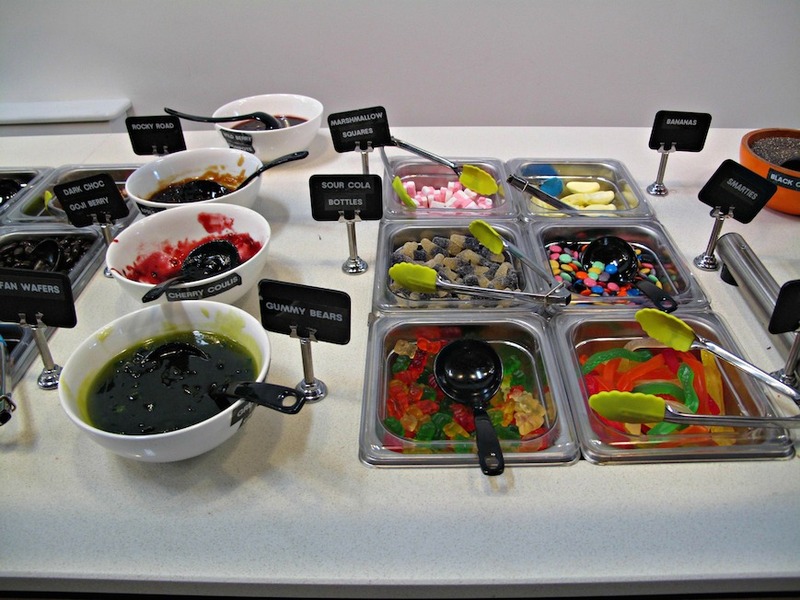 But I’m also left in even less doubt that when it comes to ice cream/gelati, you get what you pay for. Budget-priced supermarket brands cost what they do because of ingredients (“padding”) the details of which you may not want to know. As it is, our admiration for Scott and his products grows in leaps and bounds as we watch him in action and hear about how he goes about his work. 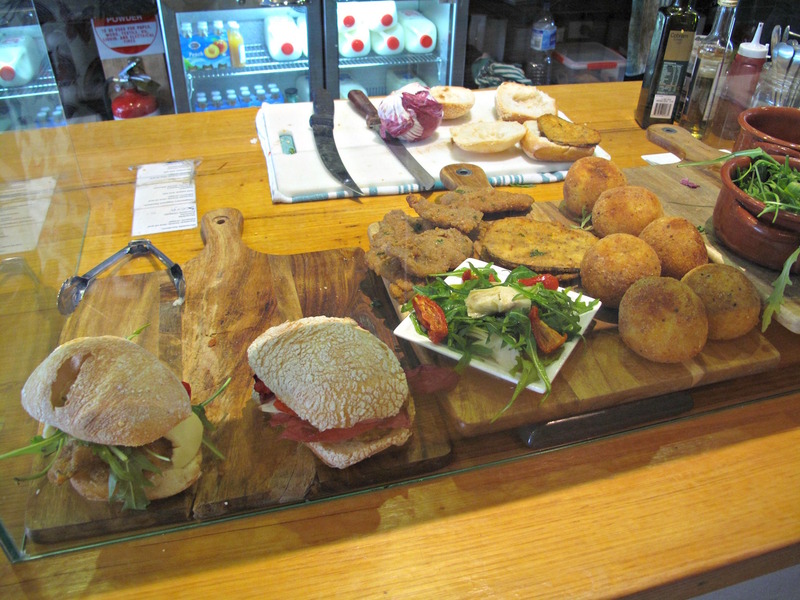 The attention to detail and solid determination to use only the best ingredients is fantastic! Here is a man, for instance, who makes his own hokey pokey using golden syrup, castor sugar and bicarb. You reckon that’s what you may be getting in your generic brand ice cream? He uses fresh fruit where available, affordable and applicable. 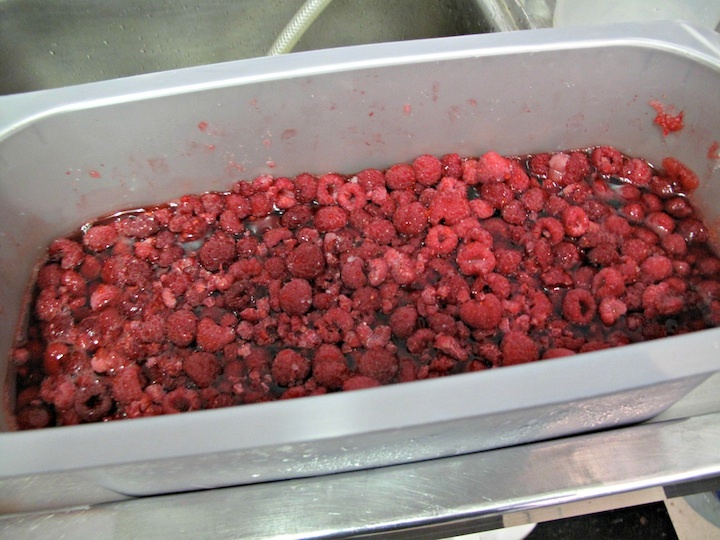 For other flavours, he uses frozen fruit just because the flavour is better or, in the case of the gorgeous-smelling amarena cherrys, a premium imported product simply because it has to be that way. 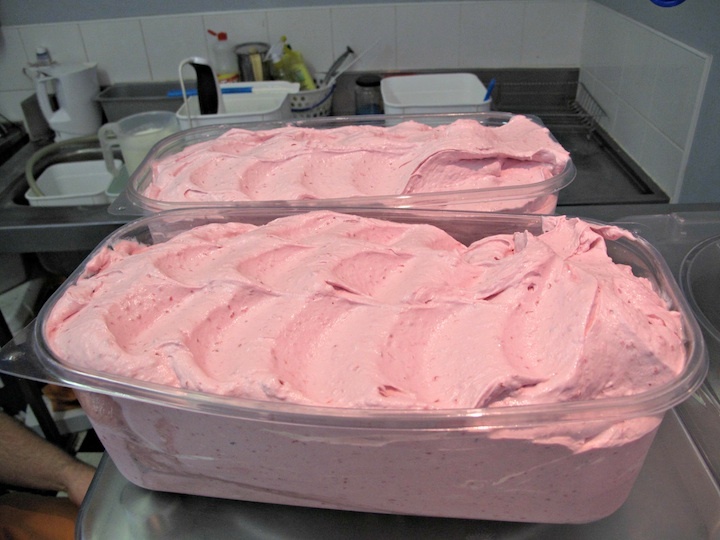 When we arrive, he has already prepared the bases of the four flavours he will be making – forest berry sorbet, raspberry ice cream, black cherry yogurt bubblegum. The bases consist of dextrose, sugar, skim milk powder and natural vegetable gums. 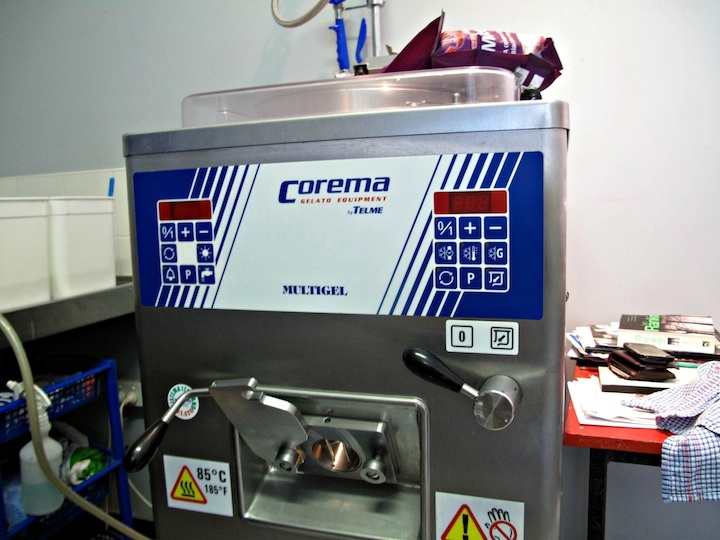 Those bases are then poured into his Corema gelati machine along with full-fat milk and the fruit or flavourings. 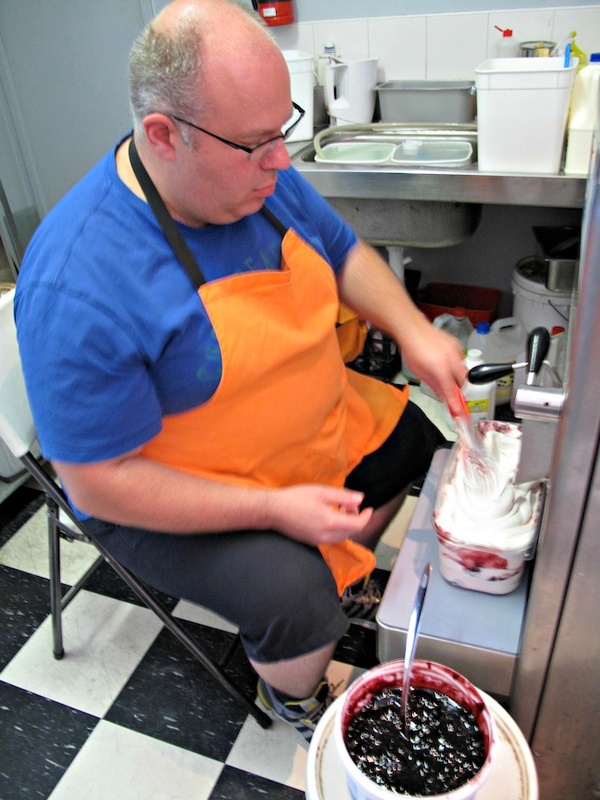 For ripple gelatis, such as today’s black cherry yogurt or hokey pokey or anything involving solids such as nuts, Scott deftly uses a spatula to weave the goodies into the gelati as it exits the machine. The gelati straight of the machine tastes delicious, of course, but has the consistency of soft-serve ice cream. 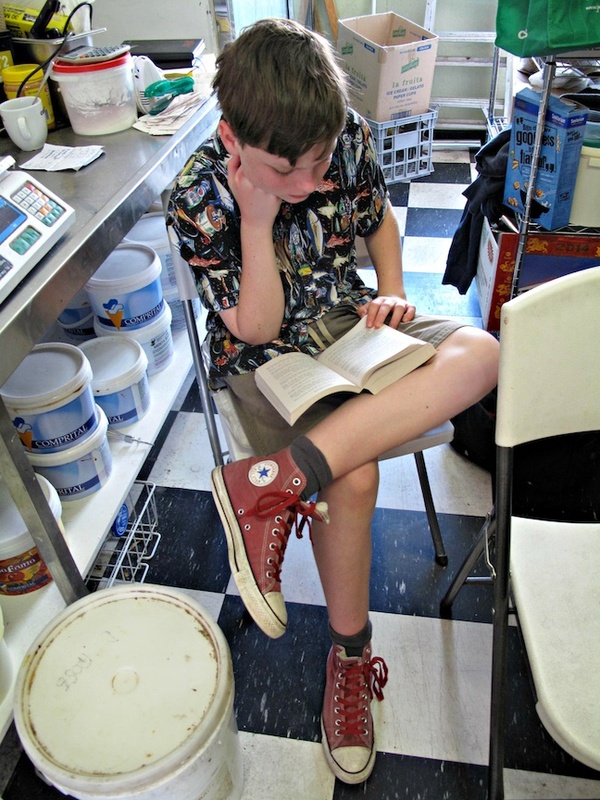 A couple of hours in Scott’s “shock freezer” fixes that up and then they’re ready to sell. Scott tells us his most popular flavours are chocolate and salted caramel. Quantities vary, but last summer found him making 300 litres in a two-day period. 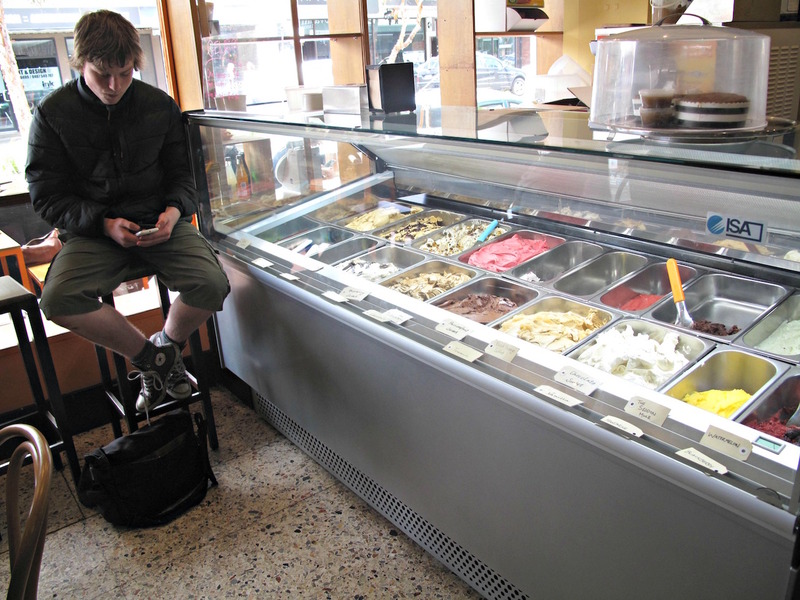 And yes, in summer and on hot days, he sells way more of his dairy-free sorbets or ices. 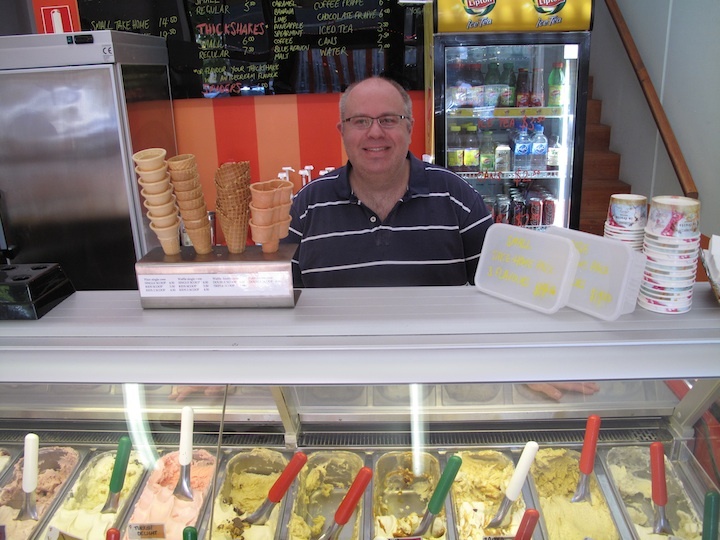 Our post about gelati in the western suburbs brought forth a number of responses, both here and on Facebook. Thanks to those comments we have at least one solid lead to follow-up. 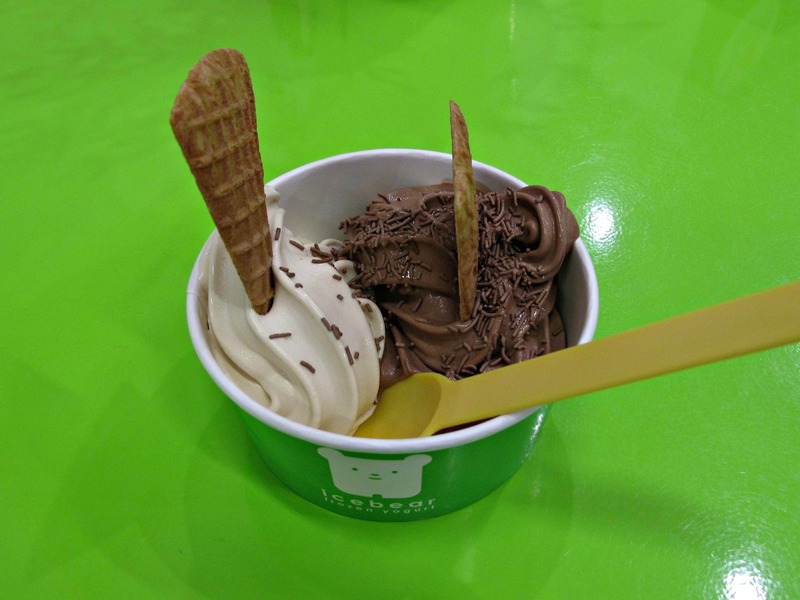 There are people in the western suburbs who love gelati. 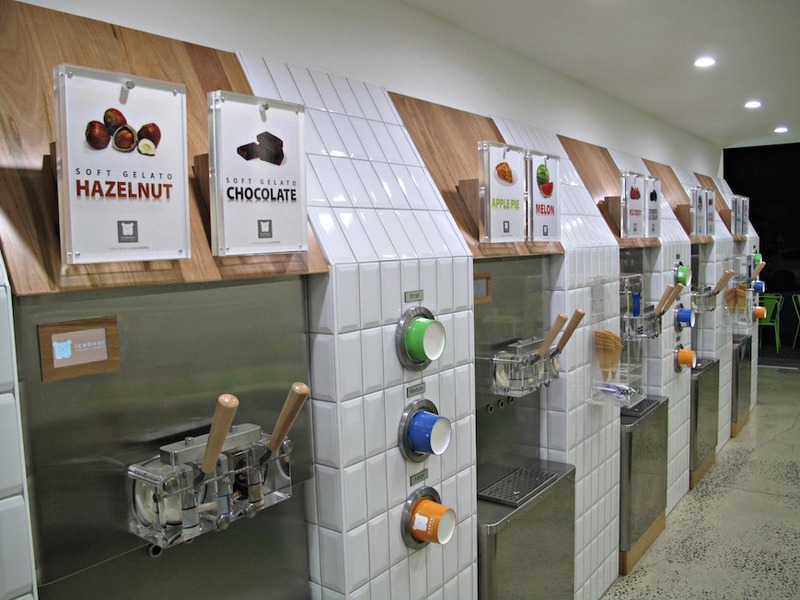 There is gelati in the western suburbs for them to thrill over. But the western suburbs will never be Carlton or even the CBD. 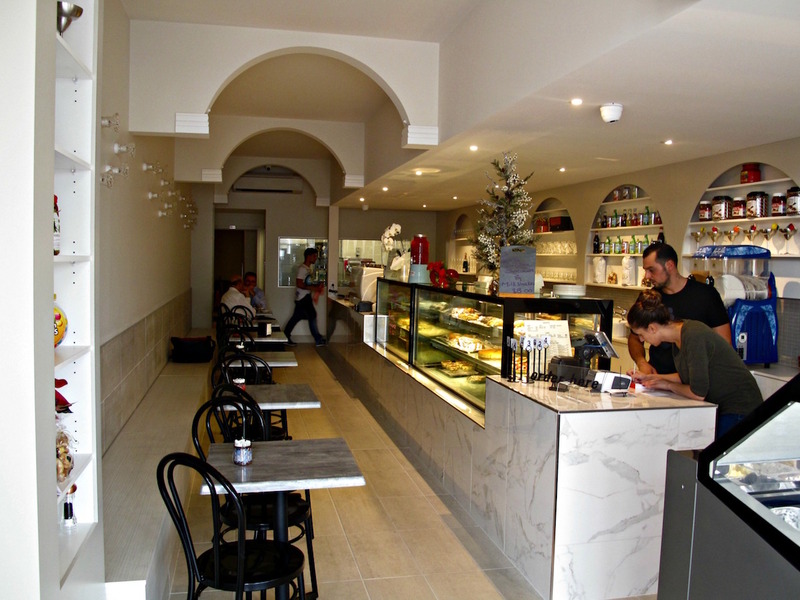 In the meantime, having gelati on our minds leads to us checking out a beaut Puckle St business past which we must have walked a gazillion times without taking much notice. 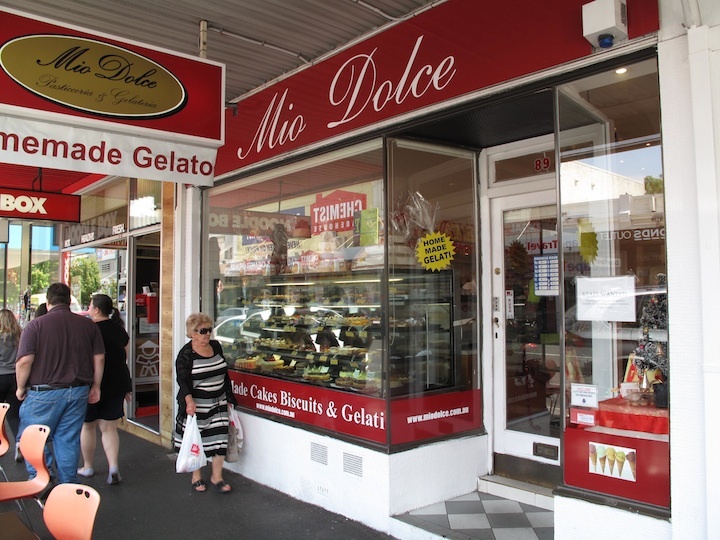 But Mio Dolce turns out to be a cosy, homespun and old-school Italian bakery and gelateria. 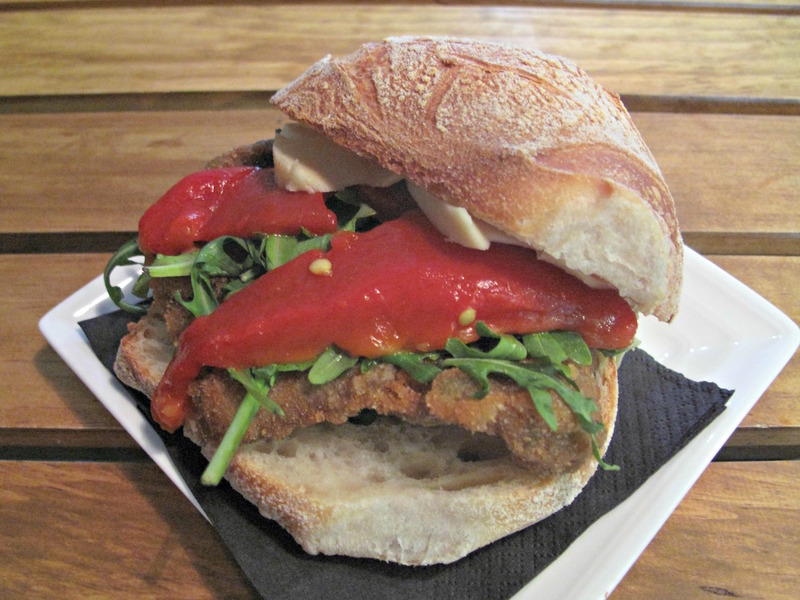 Sure, they do sandwiches and a few hot things, but the heart of this place are gelati and biscotti. 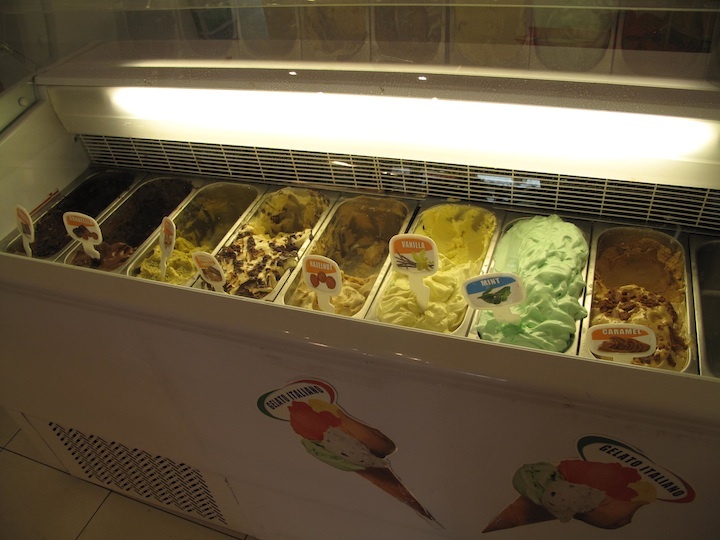 We like it that they only do half a dozen or so gelati flavours, with none of them being unusual or particularly exotic. I enjoy my very big $4.40 cup of caramel, Bennie digs his cone of donatella … sounds like a turtle to me but it’s apparently a mix of chocolate and hazelnut. My cafe latte, too, is fine. But Bennie finds his banana milkshake too sweet to handle. Could be a sign this lad is maturing, eh? 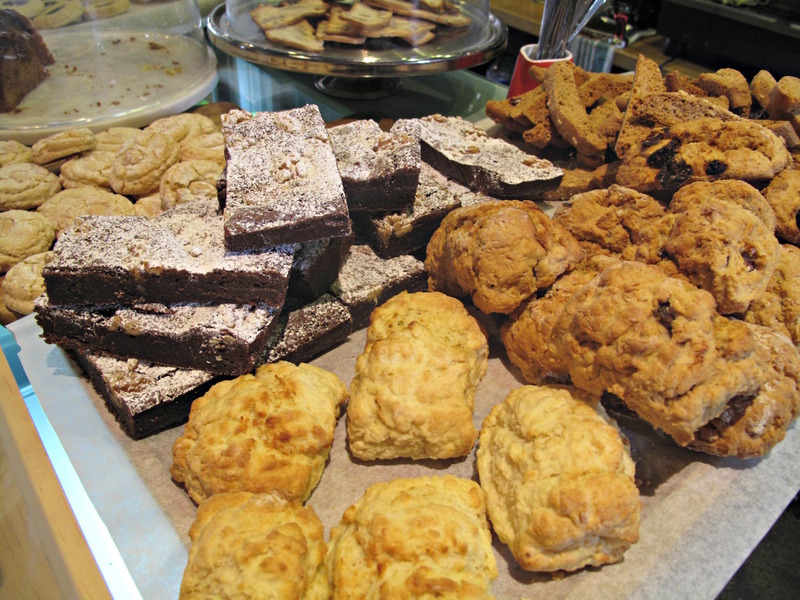 We ogle the range of biscotti, slices and other sweet treats. 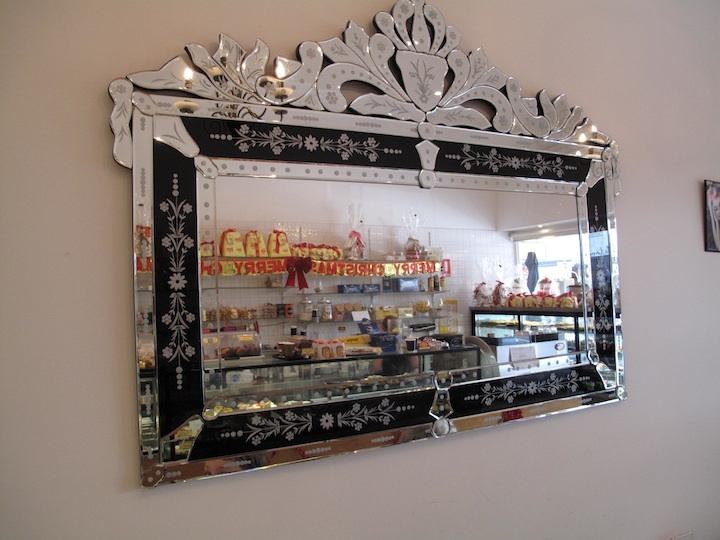 We see, among others, crostata, almond bread, almond crescents, ameretti, vienesse, romanini and florentines. 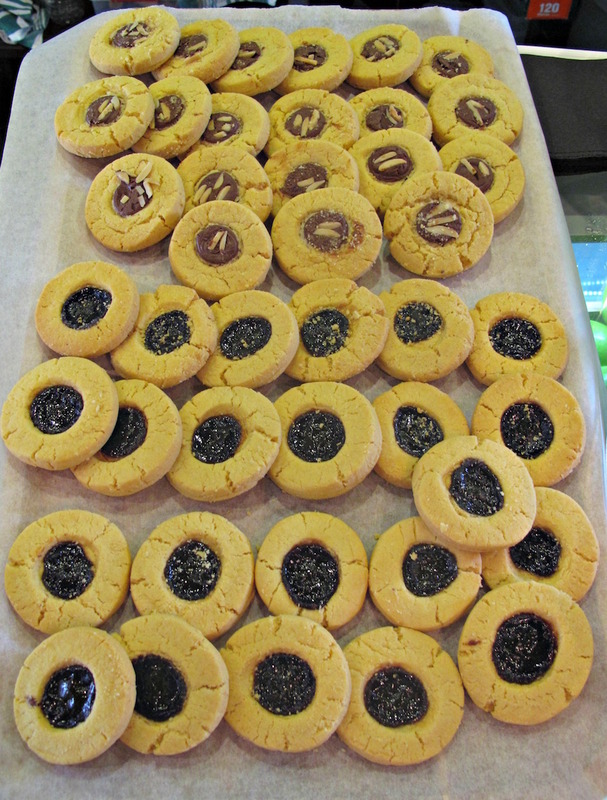 We grab a bag of “mini-romanini” to take home. As you can see, the $5 price makes this a pretty good deal when compared with the prices of similar products at our local supermarket haunts. 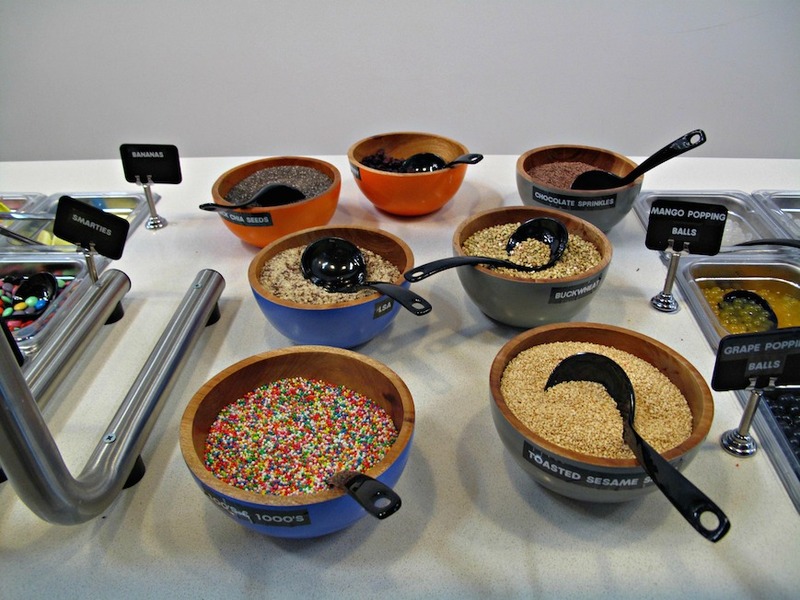 Where do you go for a gelati fix? On Christmas Day, after we’d had our fill of super-spicy food at Dosa Hut, a strong gelati lust came upon us. 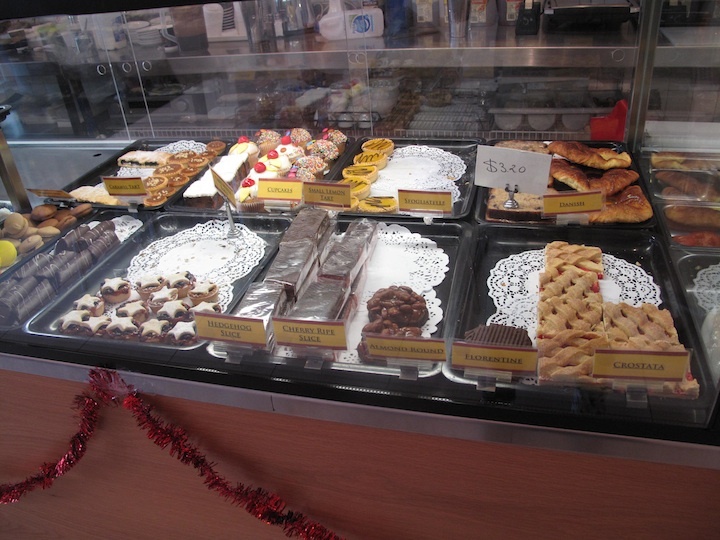 … where we figured, Christmas Day or not, somebody would be selling gelati. Upper Lygon, lower Lygon and even Brunswick Street – we were luckless. OK, OK – Christmas Day and all, but … COME ON! Seriously, had it been any sort of normal day we would for sure have hit Hello Gelo right in Yarraville Village. We’re first-name regulars and enjoy at-least weekly visits. We love checking what new flavours Scott has dreamed up and really like one of his latest – gingerbread! Outside of Hello Gelo and taking in the broader west? 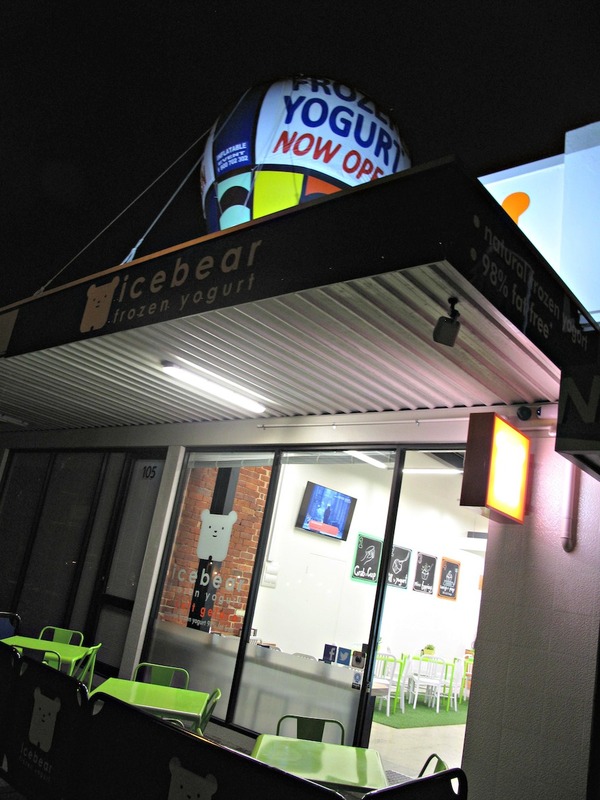 Well, there’s actually four gelati and/or ice-cream emporiums on Nelson Place in Williamstown. We’ve been customers at all four at one time or another over the years. But we’ve not warmed to any of them. 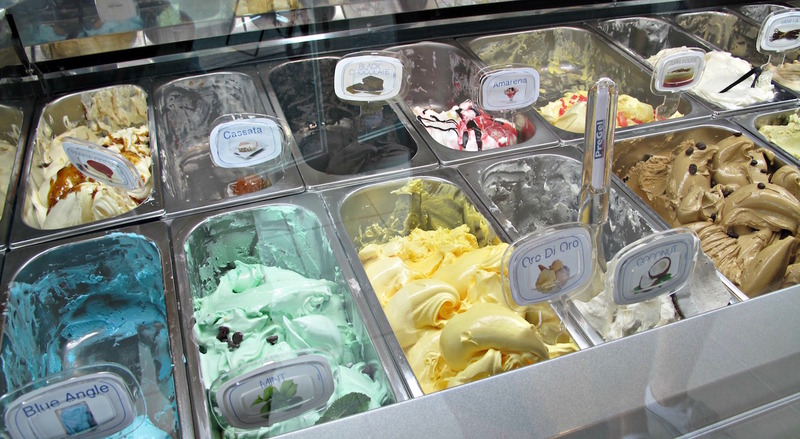 Outside of those options, I can’t for the life of me think of any other good gelati joints in the west.